A-HOTEL.com - Luksus og billig hoteller i Vilajuiga, Spania. Overnatting booking i Vilajuiga og omkringliggende. Situated in Vilajuiga, Mas Espelt features free WiFi and units fitted with a kitchen and balcony. There is also a microwave, toaster and a coffee machine. 8005 CASA ELS OLIVARS is located in Pau and offers a tennis court. Guests can go for a swim in the private pool. Set in Pau in the Catalonia region, Holiday Home Garbí has a terrace. Guests staying at this holiday home have access to a fully equipped kitchen. Set on the outskirts of Pau, Hotel Mas Lazuli boasts an outdoor pool, sun terrace and outdoor dining. The elegant bedrooms have free WiFi and mountain views. 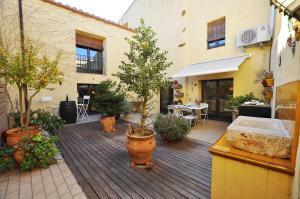 1164 Garriguella is set in Garriguella and offers barbecue facilities and a garden. This holiday home also has free WiFi. Ca la Nina is located in Garriguella and offers water sports facilities. Guests have a private terrace. Denne herregården ligger i Garriguella, 15 minutters kjøring fra Figueres og det vakre naturreservatet Cap de Creus, og tilbyr et boblebad og en sjarmerende hage med terrasse og grill. Rommene på Casa Rural Can Coll har gratis Wi-Fi, vifte og eget bad. 1131 Can Isaac Anglaterra offers accommodation in Palau-Saverdera, 15 km from Sant Pere de Rodes Monastery. Guests staying at this holiday home have access to free WiFi. Can Garriga II i III is located in Garriguella and provides air-conditioned accommodation with free WiFi, as well as access to an outdoor swimming pool. All units come with a terrace with mountain views, a kitchen with a dishwasher and an oven, and a private bathroom with bath or shower. Offering a shared swimming pool, Can Garriga is located in Garriguella, 15 km from Cap de Creus Nature Reserve. The rustic-style country house offers rooms and apartments with free Wi-Fi. 1140 Can Isaac is located in Palau-Saverdera. This holiday home also has a private pool and free WiFi. Featuring pool views, Apartment Sun Village II provides accommodation with a terrace, around 14 km from Sant Pere de Rodes Monastery. Guests staying at this apartment have access to a fully equipped kitchen. Apartment Sun Village I is located in Palau-Saverdera. The property is 14 km from Sant Pere de Rodes Monastery. Located in Palau-Saverdera, just 14 km from Sant Pere de Rodes Monastery, Apartment Sun Village I offers accommodation with free WiFi. The property features sea views. CAN ISAAC is located in Palau-Saverdera and has a private pool, a kitchen and sea views. This holiday home offers a terrace. Set in beautiful gardens, this restored 19th-century house is located in the natural setting of Alt Empordà. Casa Bastons features 3 TV lounges with fireplace, free Wi-Fi and board games. Situated in Palau-Saverdera in the Catalonia region, Holiday Home LA OLIVA features a terrace. This holiday home offers air-conditioned accommodation with a patio. This charming hotel is located in Palau-Saverdera, just 6 km from Roses. It offers air-conditioned rooms with free Wi-Fi, and there is a private parking available. El Cau de Palau er en tradisjonell landlig hotell som ligger 5 kilometer fra strendene i Rose og Port de la Selva. Her tilbys gratis Wi-Fi-internett i alle områder. Featuring air-conditioned accommodation with a private pool, Ravalet 18 is situated in Palau-Saverdera. The property is 15 km from Sant Pere de Rodes Monastery.